The best part about an Invitation to Play and Learn is that once you have set it up, that's pretty much it. The rest is up to the child. Depending on the outcomes you are looking for, it is up to you how much or little you intervene in their exploration. Sometimes if there are ideas I'd like her to try that she hasn't discovered for herself, I just play side-by-side, doing my own thing and she can see and learn from that. (eg. she was busy making and representing numbers so I started making a little pattern.. When she was done with her other things she started creating her own patterns) Otherwise, you could offer suggestions or just let them be to utilise the materials the way they want. This is what happened when I just let her be..
We can make the numbers ourselves too! I can make my patterns continue over the whole table! Mummy challenged me to use ALL of the natural materials in a pattern. It's a bit tricky but I can do it! 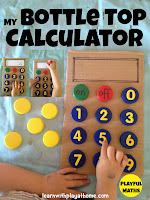 - Simplify this activity by providing fewer materials. Just some natural materials for them to put out and count and sort is a great starting point and you can add things like numbers and writing/drawing materials later. 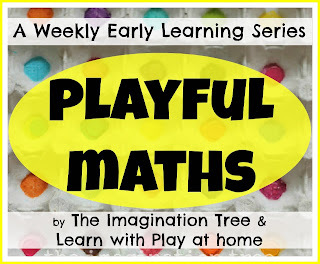 Also providing mathematical symbols like "+" "=" etc to encourage number sentences and basic addition/subtraction etc. - Mix it up by doing similar invitations with a variety of different materials. Instead of markers and paper you could provide a salt or sand tray for writing in. You could also use things like feathers, wood chips, leaves, stones etc. 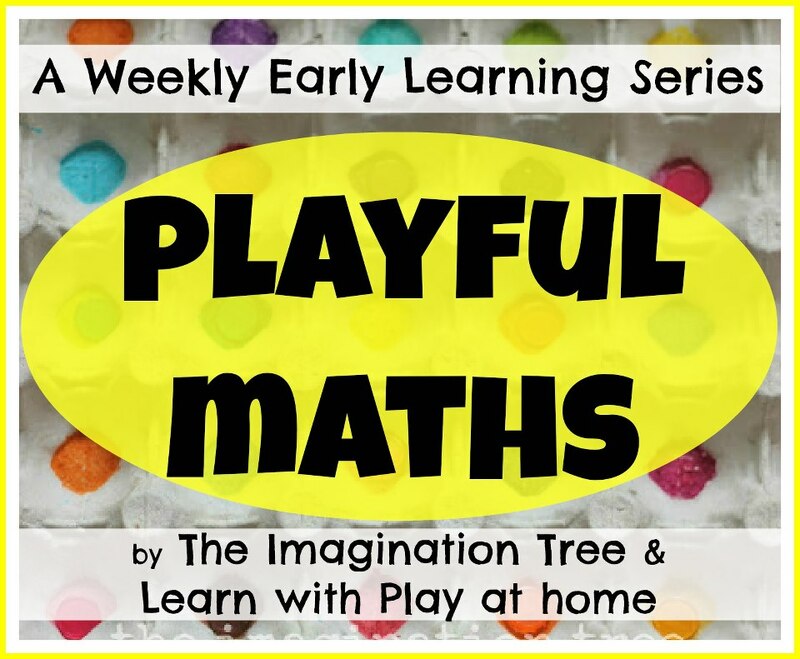 - Use the mathematical language that goes naturally with this activity, such as groups of, amount of, pattern, continue, materials, etc. - Ask questions to help lead children towards certain thinking, eg. "Do you have more gumnuts or shells?" "I wonder which of the materials you have the most of?" etc. This should encourage children to count or compare or make guesses. oooh I must keep my eye out for some foam numbers... did they have letters too?? Loving your really 'doable' maths ideas. I absolutely love seeing children work with natural materials. I think it's often forgotten about. Great post and the photography is gorgeous. Is this a new camera? Just looking at those pictures makes me so happy! Fabulous activity and post. 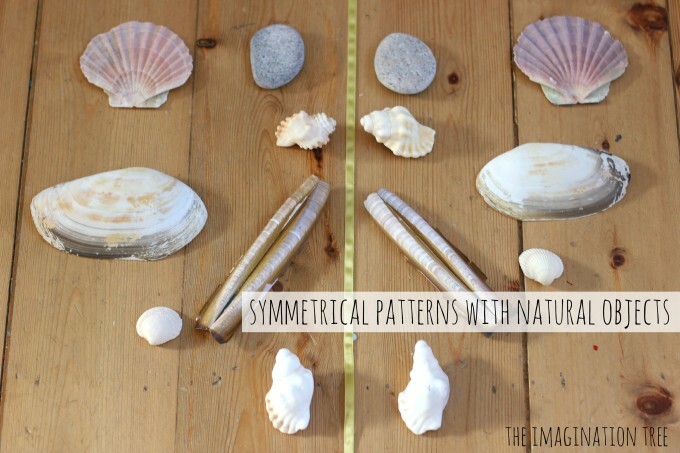 I'm a sucker for any kids activity that uses natural materials - they just make such a beautiful invitation to play. My son is about to turn three and he's really catching on to basic math concepts these days. Thanks for including suggestions to simplify the activity. He's not ready to do everything your daughter has done here but I can definitely use this as inspiration for a counting and sorting activity for him. So cool--I really love the natural element in it! You just brought back some very bad memories of stepping on those pods in barefeet in QLD Summer's!!LOL! But I love the invitation and all those wonderful materials. I bet she was having such fun...she looks so engrossed and that picture of herself is so cute! Another great maths activity Deb...thank goodness because I am awful at maths and I am storing all these up for the twins!! Ok perhaps I am weird but I am sitting here admiring your nice neat gum nuts and those lovely round seed poddy things... I think I am obsessed with natural materials! Yesterday our daughter (2) was using pinecones and seashells to play. We counted and made shapes. We saw this and I really loved the use of natural materials. We are lucky to live in Puerto Rico next to pine trees and beachfront to collect seashells. Thanks for the other ideas! Oh my goodness, this may be one of my favorite learning posts. I completely adore the use of natural materials. I think this will be a hit with my son. We use a lot of rocks in our activities but it looks like I need to expand my natural materials list :-). Love your beautiful photos as well. Thank you kindly, Sam :) It inspires me to look for more natural resources as these have been a complete hit at our house.